With the start of the school year just next week, I can’t help but feel like we are preparing for battle. Typically, one of us gets sick then passes through the rest of the household within the first month of school. So, this year we are going to be ready to fight the war on germs with PURELL! This is a sponsored post but all thoughts and opinions are my own. I am part of the Mom It Forward Blogger Network and received product and compensation from Purell to facilitate this post. Ugh. I swear, kids are just gross. I mean, let’s face it, if you don’t nag them constantly, they’re not going to wash their hands or brush their teeth on their own accord. At least mine won’t. Maybe it’s just me that has repulsive offspring. But it any case, I have an inkling that I’m not alone. Putting 30 or so kids in a classroom is like creating germ soup. Running noses, sticky fingers, saliva… all over every surface. (I’m really not a germaphobe, I promise.) But this is a reality we all must face; but more importantly prepare for. We typically end the school year with teacher gifts, but this year we are going to start it with decorated PURELL Advanced Jelly Wraps for the teachers and bus drivers. The kids are excited and actually more thoughtful about their hand hygiene. 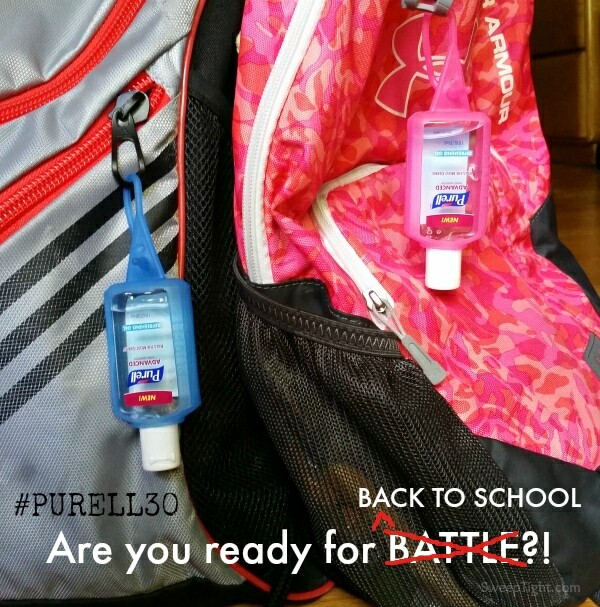 The #PURELL30 Day Challenge has also helped all of us get into the habit of sanitizing our hands. The kids are actually sanitizing their hands without me having to stay on them 24/7! We were in the barn and then heading to lunch all without access to a sink… without me having to say a word, both of them used their Purell Advanced hand sanitizer before eating! The challenge is still running so if you haven’t taken it, you can still jump in on the fun! Simply visit this Purell page to register and start participating to earn awesome prizes! There are nine people living in my house so germs and bacteria are a great concern here. Now when school starts it’s even more of a concern. We always have hand sanitizer everywhere in the house. We’ll still get sick but hopefully not as much. Must have hand sanitizer ready to use because it is right around the corner for colds and flu season. I like Purell because it does not dry out my hands and it does not have that funky smell. I really love the idea of Jelly wraps for the little bottles. I have boys so clipping this on their backpack & athletic bag would be so convenient. I love Purell! thanks so much for the heads up!